Now they’re the subject of dreams-may-come true movies. But in the beginning, they were women who just wanted to play soccer. The place: Dallas. The date: Dec. 9, 2001. The time: less than five minutes before the half in the NCAA women’s soccer championship. Perennial favorite University of North Carolina at Chapel Hill is looking to secure their 17th national title in 20 years. But Santa Clara’s women—0 for 7 in previous Final Four appearances—have other ideas. Jessica Ballweg ’05 steals the ball from a Tar Heels player and passes upfield to Leslie Osborne ’05. Osborne passes back to Ballweg. She slides a pass to Aly Wagner ’03 near the top of the box. The moment of truth: Wagner shoots into the upper-right side of the net. Gooooal! It’s the first on the board—and a world-class shot, the Tar Heels’ coach later acknowledges. In a very physical game—33 fouls and a pair of yellow cards—it will be the last point made. The Bronco defense, led by defensive MVP Danielle Slaton ’02, hangs tough. The Tar Heels do push one ball past goalie Alyssa Sobolik ’05 with less than a minute to go—but the goal is called back on an offside. When the clock runs out, there’s a new champion in town. The victors are welcomed back to the Mission Campus with a raucous celebration. Kids line up for autographs. It’s a glorious moment—and the culmination of something long in the making. Because before there were first-class facilities and scholarships, before there were sponsorships from Nike, Adidas, and Under Armour, before there were fans in the stands, there were students who simply wanted to play. During the 1978–79 school year, women’s soccer became a collegiate club team and began playing against other universities in the Bay Area. They acquired their first coach, Mike Sheehan ’77, a player on the men’s soccer team. By 1980, they were in the big leagues: an NCAA Division I team. Two years later, the NCAA sponsored the first Women’s Division I Soccer Championship with a 12-team tournament. 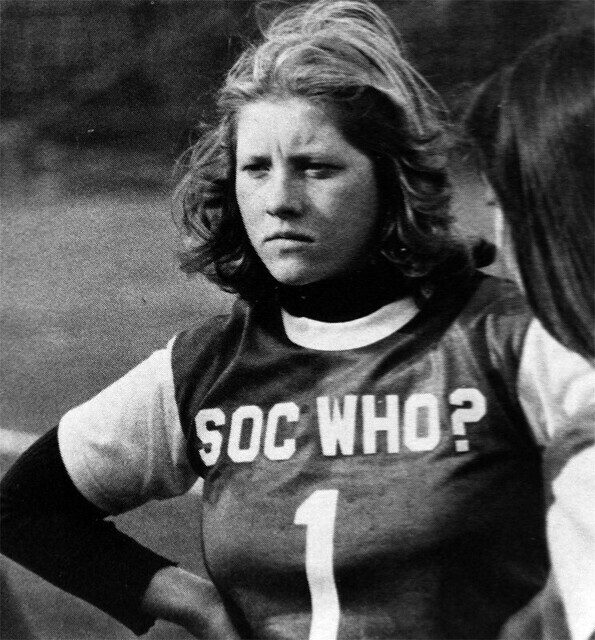 Kathy Kale ’86, now assistant vice president of alumni relations at SCU, played on the team as an undergraduate. “There were about 30 people in the stands,” she says. “Only parents who lived in the area came.” There wasn’t a single scholarship, regular budget, or even enough money to pay a full-time coach. When Jerry Smith joined the women’s soccer program as head coach in 1987, he said that they had the most important thing of all: fantastic players—thanks in part to Smith’s predecessor as coach, Mark Narcisso. How good were they? And not only win. In 1996, Santa Clara both advanced to the Final Four and hosted the NCAA Women’s College Cup. Buck Shaw Stadium was packed to the gills. With additional seating brought in for the two-day tournament, the event set a record for the most attendance ever at a women’s outdoor collegiate sporting event. After winning the national championship in 2001, Aly Wagner was named national player of the year. And Santa Clara soccer became the stuff of the silver screen: Bend It Like Beckham cast Parminder Nagra and Keira Knightley as two 18-year-olds from the U.K. who get scouted by SCU and are awarded soccer scholarships. They head off to California to pursue dreams of being a big-time soccer star—just like David Beckham. Today, inspirational sayings, framed newspaper clippings, autographed soccer balls, and tournament trophies adorn Coach Jerry Smith’s office. They announce, in no uncertain terms, a tradition of success in a nationally known program. Santa Clara has been to the Final Four Tournament 10 times. Only UNC-Chapel Hill and Notre Dame can boast more than that. The women’s program has had 14 NCAA quarterfinal appearances, 22 NCAA tournament appearances (there are now 64 teams in the tourney), eight WCC championships, 17 teams ranked in the Top 5 nationally, and six teams that ranked No. 1 nationally. More than a dozen Brono women have gone on to play pro soccer in the United States. On the world soccer stage, 14 have represented the United States in international competition. Ten Broncos have participated in World Cups representing three countries, and four Broncos are Olympians. Some have also played in soccer leagues overseas. Perhaps the single most iconic moment in women’s soccer history belongs to Brandi Chastain. In the 1999 FIFA Women’s World Cup, before 90,185 fans at the Rose Bowl, Chastain led the U.S. team in a penalty kick victory over China. She whipped off her jersey in celebration and fell to her knees, fists clenched in victory. But none of it happens today—and none of it would have begun in the first place—without women who love to play.